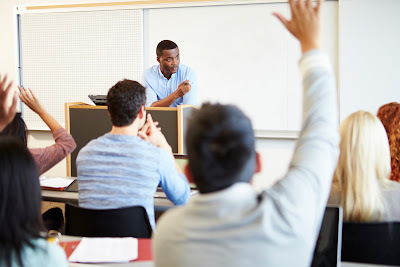 A common teaching practice is to throw a question out to the class. When a student provides a wrong answer, it can be awkward for both you and your student. What should you do? The way we answer these questions impacts the learning environment in our classes, according to a study in the American Educational Research Journal. Conversations with colleagues Darryl Yong and Lelia Hawkins generated these five suggestions for constructive responses to misconceptions. Create a safe space for incorrect answers. This takes time and care. For example, you can say "I’m so glad you raised that point. We often think [incorrect idea] because [some kind of reason], but actually if you take into account [key idea] it leads to this other way of thinking, which is correct." This emphasizes that reasonable attempts at solving a problem can sometimes lead to incorrect solutions. After all, many published proofs have later been found to contain errors. Keep a poker face. Make sure no matter what the student says that you ask the student to justify the reasoning behind the answer. Try to not give away whether the answer is correct. Another option is to have a different student discuss whether the answer is right or wrong, and why. Focus on the reasoning. The poker face is also important to encourage students to share their reasoning, without fear of discouragement from negative reactions. It also prevents them from changing their answer (based on the look on your face) without diagnosing the cause of their error. Distinguish between types of errors. You may or may not want to give a lot of time to discussing a typo, versus a common misconception or confusion. Sometimes it is important just to correct and move on. As you choose approaches, you can be intentional about why you ask questions and how you solicit answers. Are you trying to do a quick check for learning and retention? Do you want to elicit discussion? The purpose of the question should dictate the way in which you handle any responses, correct or incorrect. Hughes, David C. "An experimental investigation of the effects of pupil responding and teacher reacting on pupil achievement." American Educational Research Journal 10.1 (1973): 21-37. These are great! I'd add: don't be afraid of a followup question. Once you hear the answer, you might realize what the question was that you should of asked that student that was more their level, and asking that gives a student a chance to end on a positive note.